Boston Shamrocks captured the ladies junior football title with a fine performance to defeat the Connacht Ladies. A goal in each half underlined the Shamrocks win and deflated any Connacht Ladies hopes of pulling off an upset. Joe Lydon presents the cup to Stacey O'Dowd. Early in the second half the Shamrocks netted a second goal, McDonnell the scorer this time, and it would be proverbial mountain for the Connacht Ladies to climb. McDonnell added two points, and Shannon Mullen a third to put the Shamrocks firmly in control. Connacht Ladies continued to fight, with Saoirse McTavish and Andrea Feeeney working hard in the back line. The efforts of the westerners were rewarded with points from Joanne McDonnell and Aisling Kerr, but that Shamrocks mountain just kept getting higher. It was delight for the Shamrocks when the final whistle sounded and the junior championship is added to the Orla Benson Cup. 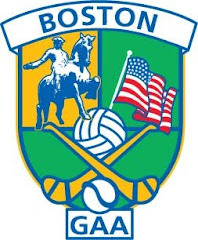 Boston Shamrocks Celebrate the Ladies Junior Championship. The rivalry continues as the senior teams meet in next week’s final with the Shamrocks hoping to cap a winning season with a double, while Connacht Ladies will be hoping to win back to back senior titles in what promises to be an exciting senior final between the two clubs. Shamrocks: Eileen Kerins, Chloe Laffan, Stacey O’Dowd, Cathy McEleaney, Ann Marie McDonnell, Brittany Maguire, Louise Larkin, Leanne McCrystal, Sheila McLaughlin, Shannon Mullen, Ciara Murphy, Sharon McGovern, Kayla Donovan. Connacht Ladies: Caroline Heraty, Andrea Feeney, Saoirse McTavish, Irene Greene, Joanne McDonnell, Aisling Griffin, Aisling Kerr, Rachel O’Driscoll, Aisling Mullen, Maria Grogan, Jacqueline Moan, Jackie McDonagh, Kelly Kenneally. Advertise on Thar an Trasnán! Place your ad on this Blog. Send an email to upthegaa@gmail.com for more information. If you are interested in advertising your business please send an email to upthegaa@gmail.com.